2018: Participate in the Junior European Championships and World Championships with the Swiss Junior National Team. On May 13th I was selected as a member of the Swiss Junior National Team A. I will participate in the Junior European Championships in Finland and in the Junior World Chmapionships in Hungary in the summer 2018. Another goal reached! 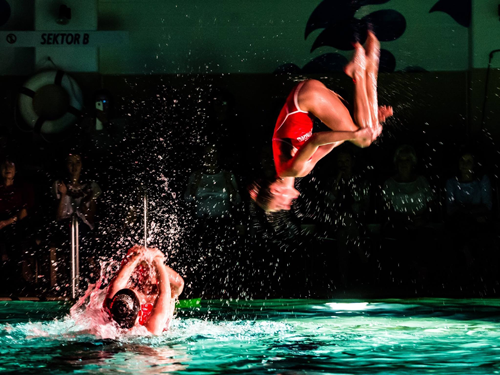 2017: Participate in the Mediterranean Synchronised Swimming Cup (COMEN Cup) with the Swiss National Youthe Team. This is the unofficial World Championship for National Youth Teams. I reached this goal and not only that. My team and I won three bronze medals! With 73.36 points I achieved the best result of the Swiss Team in the figures competition. Thus we were the most successful Swiss Team in the history of the COMEN Cup. In the long term I would like to participate in the Olympic Games. My athletic journey started at the age of 3. Fascinated by movement to music I attended kids’ gymnastic as I couldn’t wait to embark on classic ballet at the age of 4. However, I only dared to go in a pool or the sea with swimming wings and a safety ring! I quickly lost my fear of water when I was 5 years old and started swimming courses. And not only that, I loved it to dive and be under water! A few years later I discovered the perfect combination of dance, swimming and diving. In synchronised or artistic swimming as it is called now, I have found my passion. In 2012 my parents moved to Brussels, Belgium. I had just been practicing synchronised swimming for a year when I joined BRASS, the Brussels Aquatic Synchro Swimming Club. After a summer camp with Virginie Dedieu in France, I returned to my home pool and went on to win all regional and national titles of my age group. When we returned to Switzerland in 2014, I joined the Limmat Nixen Zürich. The following year I passed the selection for the Swiss national youth squad and in 2016/17 I joined the national youth team. Thanks to my enrolment in a sports school I can attend about 25 hours of regular training every week. My biggest dream is to participate in the Olympic Games. I know there is still a long and hard way ahead of me, but look at how far I have come since the swimming wings and the safety ring! I am totally motivated to continue working hard to achieve my goals. Sport as a passion and as a profession needs sponsors. I would be delighted to receive your support. In becoming my sponsor, you can accompany me on my path to success. Please contact me via this form.